Dr. George T Schirripa, MD is a Doctor primarily located in Yonkers, NY. He has 33 years of experience. His specialties include Ophthalmology. He speaks English. Dr. Schirripa has received 3 awards. The overall average patient rating of Dr. George T Schirripa is Great. Dr. George T Schirripa has been rated by 28 patients. From those 28 patients 9 of those left a comment along with their rating. The overall rating for Dr. George T Schirripa is 3.9 of 5.0 stars. I have a very complicated eye issue . Cornea disease and cataracts. Dr Schrippa was able to perform cataract surgery and ensure my cornea stayed in tact . He is a skilled surgeon and a compassionate doctor . His office team treats everyone with respect, patience and respect . I am a second generation patient with him. He treated my parents and now me and my daughter . He is the best by far , a blessed surgeon..
Best Eye Surgeon in NY.. Honest Caring Takes the time to give all the info you need to make an informed decision and is always available!! Dr Schirrippa is so compassionate and thorough. I have been his patient for the past 20 years. I love Dr. Schirripa! He's the best! He's so thorough, and he has such a lovely way about him. He puts you at ease right away and he does not leave you until he has answered all your questions. He runs a good office, and he has a lovely staff. A "win-win!" Thanks to Dr. Schirripa for making me see so much better than before! Wonderful personality and extremely competent. Office and tech staff very friendly One of only two of my doctors (several) who I actively recommend to friends. 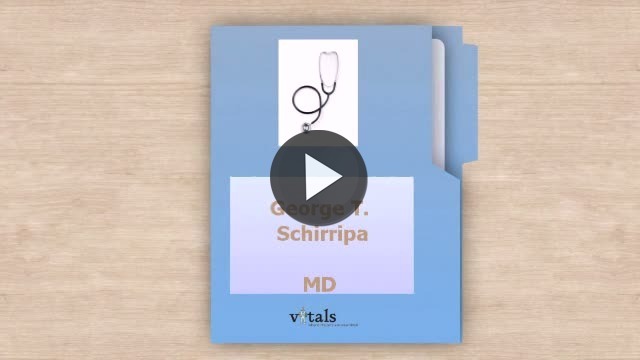 Take a minute to learn about Dr. George T Schirripa, MD - Ophthalmology in Yonkers, NY, in this video. Dr. George T Schirripa is similar to the following 4 Doctors near Yonkers, NY. Have you had a recent visit with Dr. George T Schirripa? Select a star to let us know how it was.